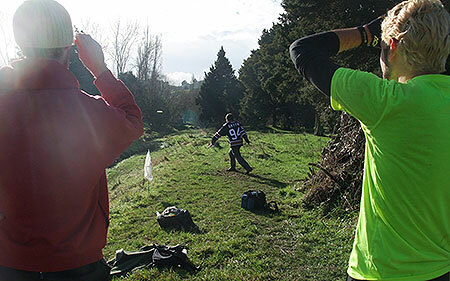 The King Country Disc Golf Classic 2014. NZDG President Nigel Hailstone reports..
Blair Joines. Master. It is a category and a descriptor. At Taumarunui Blair ignored the cool conditions and the assembled chasers to put on a master-class. In bookending the 4 rounds with 51’s, Blair ably demonstrated how comfortable and capable he is with his game. This was a field full of talent. Present were Jackson Sullivan of recent Woodhill accomplishments. Dean Marshall fresh from prevailing at McLaren Falls, and a supporting cast of regular top group contenders. But to no avail. Blair was at home in every sense. But how? Is it the natty threads, the fresh plastic, the swarming groupies? Nope. That's not Taumarunui and certainly not Blair. Blair is better understood by his wry grin, the glance up from the contemplation he routinely gives the ground a meter ahead. The few thoughtful words you may or may not hear. His is a contained game which finds what works and works until he masters it. It doesn’t hurt that Blair has the good fortune to play regularly with another of our game's regular contenders Pete Boyle. Pete, our TD put his own master-class of sidearm on for those lucky enough to see him at work. Gemma Sullivan continued her hot streak taking the Women’s title with ease. 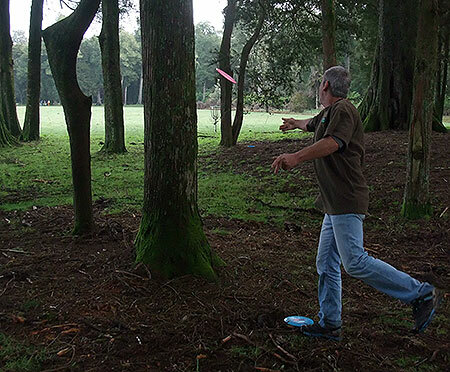 Open went to disc golf’s new Tour Director Brad Muir who must be wondering how long he has to play before he bests those old guys! Great to see an excellent field including some new players, a onesy wearing character from the Hutt and a grinning Albertan via Queenstown. It was chilly but the foul weather had blown through and extended our run of good weather on tournament weekends. And what a top weekend. Best of luck all for the upcoming Tuckers Beach Tourney and hope you have as much fun as we did. Finally, thanks again to Pete and Corryne for opening their home and hearts to the disc golf community yet again and looking after us so wonderfully. 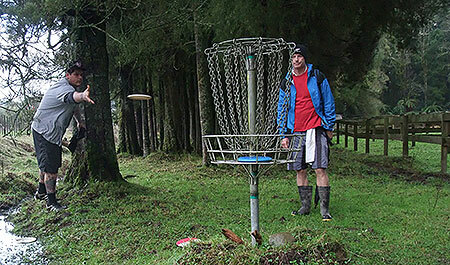 Welcome to King Country - No matter which direction you come from, you start to enjoy that feeling of some awesome New Zealand scenery an hour out from Taumarunui..
Discs in the Mist - Not a Gorilla, Prez Nigel Hailstone in putting mode at an early stage of proceedings. Chain Focused - Wellington's Winston Rawiri is new to the tour but already addicted. Queenstown Style - Nick and Brady watch Robin Lily drive #3. 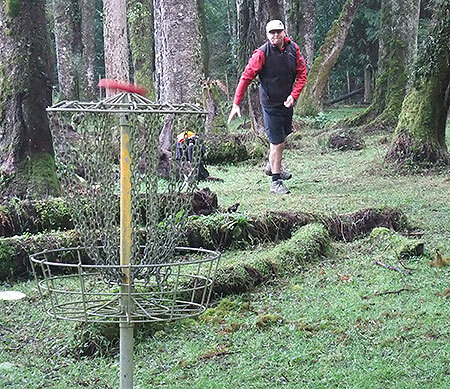 DJ Play - Rotorua golfer Andy George has a crack at the tricky basket placement on #8. Mossy Masoe - "Don't be low, don't be low" thinks Nigel Hailstone. Bugger! Too high! God-like - Des putts from the shade as Andy soaks up some rays. 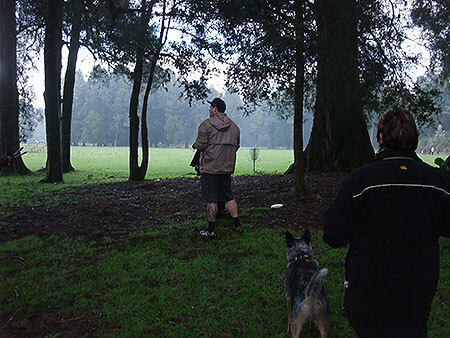 The Jackson Sullivan supporters club - Mum (still contemplating a disc golf come-back) and the Blue Healer. Joyful Addiction - Jenny has a sweet addiction to this awesome sport. 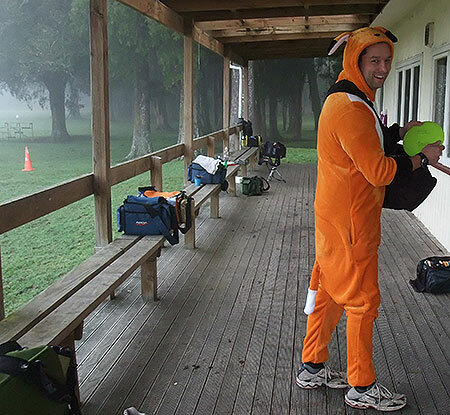 Wild Life - Yep, not to be outdone by the Human Highligher, Sky Highway from Wellington played a full round in this onesy! 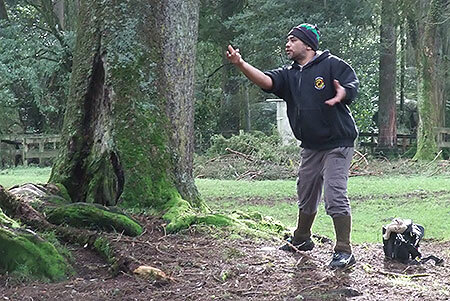 Trunk in Charge - Upper Hutt golfer Winston Rawiri managers his way around the tall timber. Another Par - Jacko Sullivan slams his putt into the chains on 17 as a gum-booted Juan Unda looks on. 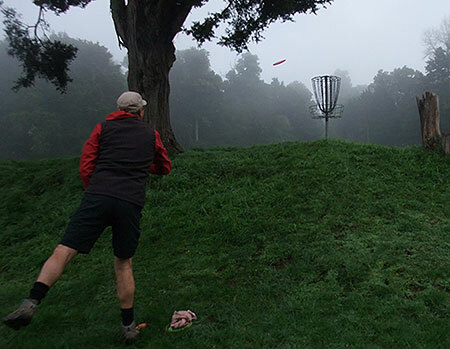 Just don't hit a tree - National Park's Des Cooper winds his way to the basket on #10, avoiding trees of all sorts of shapes includng one looking like De Haas' left hip. 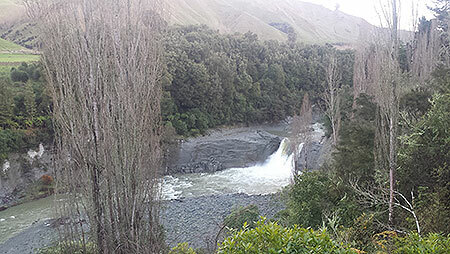 Creeks and Groans - Bugger! 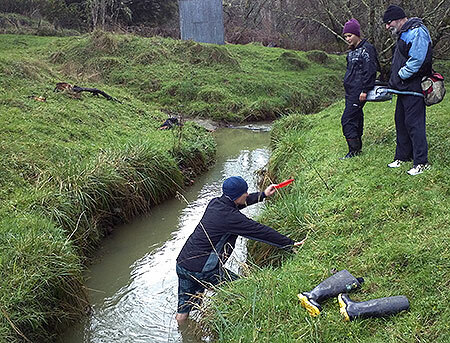 Even too deep for the Safemates, Tim Mayson climbs out of the creek to the amusement of playing partners Pete Boyle and Coby Waller. Give it heaps bro! 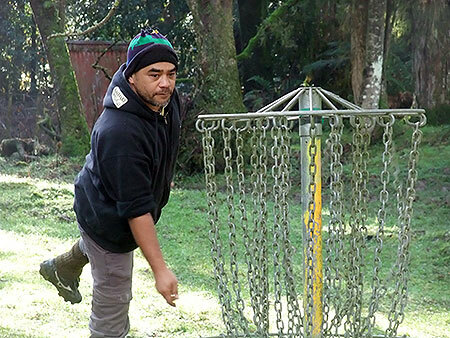 - Auckland golfer Nick McKay gives it everything on the open hole 9. Gentil-y does it! - The GM slots it between the solid sentinels protecting basket 13 with a nice putt into the basket. Waiting for the Hooter - The Sunday morning round about to get under-way. 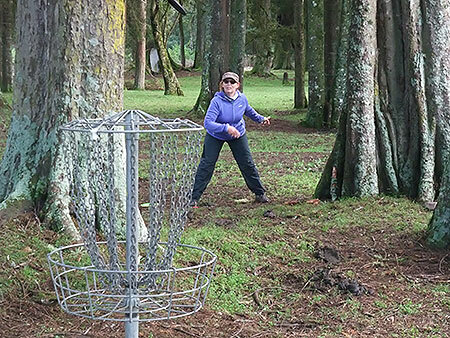 Sturdy Limb - Wellington golfer Stephen Fargher plays to basket 10 in front of the standing troll's tree that gathers moss. Snookered -There were some places on 15 you really didn't want to be. Good luck Winston. 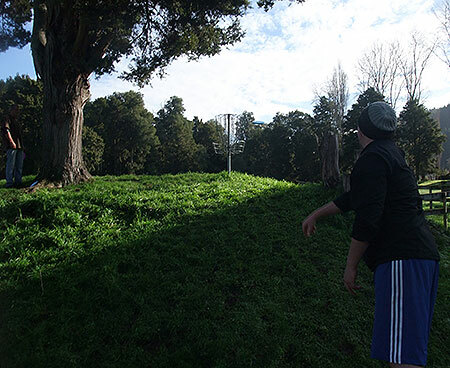 Begone with Good Tidings - Hole 14 and Wellington's Winston Rawiri sends his disc towards the first obstacle - the line of trees blocking entry to the awesome area where the basket is located - somewhere whilst keeping clear of the OB to the right. 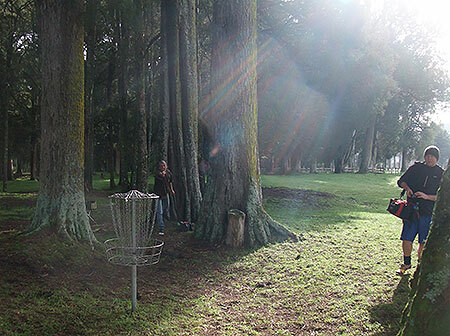 Tall Timber - Another angle of the drive for hole 14, this time Shane Sullivan (Levin) firing yet another beauty. Dropping In - Multi National Champ Bob Gentil threatens the chian whilst ensuring and easy drop in should it miss - that's the way to do it! Roller Derby - Many player got caught out by the trickey dogleg 8th, some smarty pants electing to try the roller approach to enter the curve on the edge so to speak. A Shady Lot. - As the Sunday afternoon sun shone, we presented the King Country Classsic 2014 Champions. Brad Muir Open, Blair Joines Masters & Overall, Pete Boyle SGM, Gemma Sullivan Woman's & Des Cooper GM. Congratulations!.